Just when you thought that it is easy to discard all "Ebola zombie" stories as hoaxes and move on, here comes a twist. ABC Good Morning America's Dr Richard Besser has documented an episode of a man resurrecting, after being dead from Ebola for a while. According to Besser's report, he and his producer were driving back after an assignment in Liberia's Monrovia, when they spotted an angry mob surrounding a dead man along the roadside with a burial team. When Besser got down to enquire what was happening, a localite told him that the man had died after being hit with the Ebola virus. Despite several calls from the locals to get the man some medical help, no ambulance ever showed up. However, when the man died, the burial team was sent within an hour. "We couldn't get him help when he was alive," an unidentified local man was quoted as saying by ABC. "They only come when you die." Besser goes on to describe the scene and writes that while they stood and watched the burial team suit up the dead man, spray him down with bleach and move him to a plastic sheet, the man's arm moved. The crowd immediately realised the man was alive, and the burial team unwrapped him and put him on the ground again. The man apparently did not look like he would be alive for long, Besser's report says. An ambulance and a team of health officials were then sent to get the man and give him medical attention. Swiftly spreading cases of deadly Ebola virus outbreak has left many in a state of shock and fear. Several cases of Ebola victims coming back to life have been floating around online, and one Liberian newspaper recently reported two such cases, causing further furor among people. "Two Ebola patients, who died of the virus in separate communities in Nimba County have reportedly resurrected in the county. 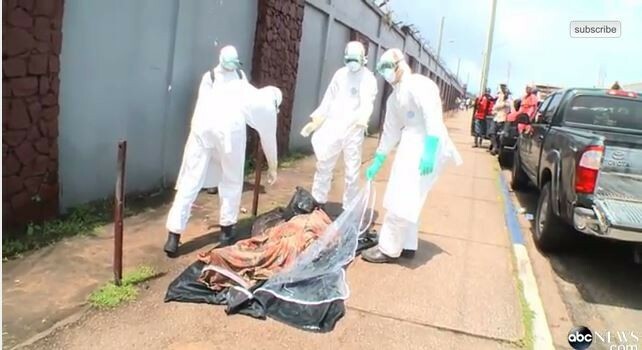 The victims, both females, believed to be in their 60s and 40s respectively, died of the Ebola virus recently in Hope Village Community and the Catholic Community in Ganta, Nimba," Liberia-based newspaper The New Dawn claimed earlier this week. The allegedly dead women were identified as Dorris Quoi from the Hope Village Community and Ma Kebeh from the Catholic Community. The report also claimed that residents of the village were left panicking after witnessing the resurrection, and were not letting the resurrected women stay in the community anymore. While many websites have dismissed the stories as bogus, including hoax-debunking site Snopes.com, the latest report from Besser is far from dismissible with a video footage accompanying the report. According to a report by the World Health Organization, a total of 3,300 people have died from Ebola and the death toll continues to soar. Ebola, a fatal disease in humans, is transmitted to people from wild animals and spreads in the human population through human-to-human transmission. It causes acute illness and internal bleeding, leading to the death of the patient. The current outbreak in West Africa is the largest and most complex Ebola outbreak since the virus was first discovered in 1976, according to WHO website. To read more about the disease, click here.